Michael Jeser, Federation CEO, shared, “I was especially proud of this session because of what it says about our Federation’s role in the community. We often say that Federation takes a balcony level view of the needs of the entire community. Strengthening the pipeline of leaders is an ongoing and daunting challenge for many of our organizations. This session was a wonderful example of how our Federation is investing in building future leadership not just for Federation, but for the ENTIRE community. I witnessed the almost one dozen agency professionals not only enjoying their interaction with our participants, but expressing appreciation for being introduced to these amazing current and future leaders. We are beyond grateful to Pauline Foster's z"l family for supporting and investing in this vision for our future. 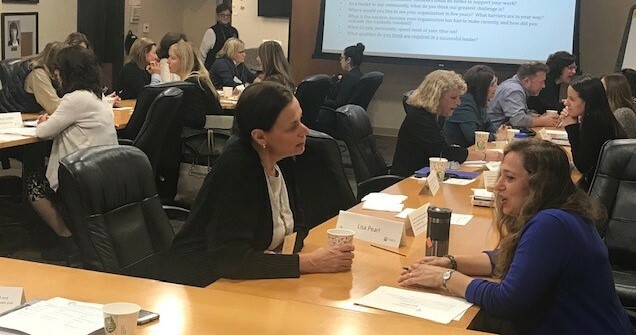 After a powerful D’Var Torah, PFWPLI participants were matched with the Jewish organizational professionals for a fun and lively “Speed Networking” session. With a timer running, each participant had 5 minutes to explore challenges, successes, organizational philosophies, and more. Judging by the intensity of conversation and enthusiastic participation, there were several meaningful “matches”, and important conversations happening at every corner. Thank you to all of our participants for your partnership and commitment to building community. To learn more about The Pauline Foster Women's Philanthropy Leadership Institute please contact Jodie Graber.